The Cargo Incident Notification System (CINS) has won the prestigious Bureau International des Containers (BIC) 2017 BIC Award. Presented annually, the award honors an individual or organization for notable contributions to safety, security, standardization, or sustainability in containerized transportation. The BIC Award was presented to Ken Rohlmann of Hapag Lloyd, CINS Vice Chairman, and Jean-Christophe Triat of the Mediterranean Shipping Company (MSC), two of the founding members of CINS, in recognition of the work that CINS is doing to share information and improve safety aboard vessels and throughout the supply chain. 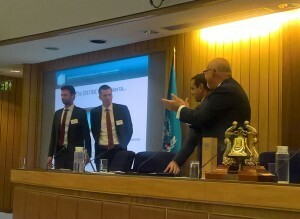 “CINS is a unique group of international experts, acting independently from any commercial interests, purely driven by the aim to enhance the overall safety for our colleagues on board of our vessels and within the entire transport chain,” said Mr Rohlmann on accepting the Award. The presentation of the 2017 BIC Award was made during the annual meeting of the sub-committee on Carriage of Cargoes and Containers (CCC) at the International Maritime Organization (IMO) headquarters in London. It was presented by Douglas Owen, BIC Secretary General, and Giordano Bruno Guerrini, Chairman of the Board for the BIC. CINS was established in 2011 by five of the world’s biggest container lines; CMA-CGM, Evergreen, Hapag-Lloyd, Maersk Line and MSC, with the objective to highlight risks posed by certain cargoes and packing failures. By collecting this data within the CINS online database, trends and incidents requiring immediate action can be more easily identified than ever before. Through analyzing trends and database information, CINS is helping to ensure that safety is improved. For example, once areas of concern are identified, they can be addressed to relevant authorities to formulate appropriate recommendations or advice. This can include suggesting amendments to the International Maritime Dangerous Goods (IMDG) code, or offering advice on training around the correct packing and securing of cargo. By collating information around all incidents resulting in injury or loss of life, loss or damage of assets, or environmental concerns, CINS also supports the industry by ensuring that shipping lines have facts to rely upon in the event of regulatory intervention. There are now 14 shipping line members of CINS representing two-thirds of the world’s containerized capacity, all of whom are able to access the information within the CINS database. There are also a number of Advisory and Honorary Members. It is led by a board of five experienced industry professionals from the founding container lines. “This BIC Award is greatly appreciated by the CINS team and it will certainly act as an incentive to continue the committed work by CINS member companies,” says Mr. Ernst-Frederiksen. For more details about CINS, visit www.cinsnet.com. For more information about the BIC, visit www.bic-code.org.